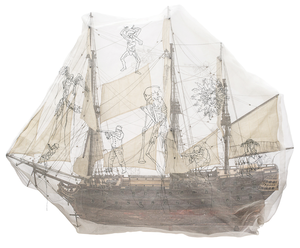 Hew Locke, an Anglo-Guyanese artist who lives in Great Britain and spent his formative years in Guyana, consistently explores themes of race, colonialism, displacement, the creation of cultures, and the visual codes of power, drawing on a deeply personal visual language. In a complex and war torn contemporary world where we continue to see waves of refugees fleeing lives of persecution and privations, Hew Locks’ work is as contemporary as it is historical; embodying both metaphorical and symbolic meaning. 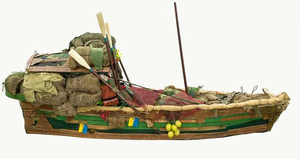 Hew Locke: The Wine Dark Sea presents new works by the artist that highlight Locke’s acclaimed sculptures of boats, which occupy an important place in his personal iconography. "The wine dark sea" is a description of the Mediterranean used by Homer throughout The Odyssey, and the phrase is repeated by Derek Walcott in his epic poem Omeros set mainly in the Caribbean, and referencing characters from The Iliad. Locke’s visual poem likewise points up the universality of many of our experiences.